For as long as I’ve been teaching content that requires more than a handful of notes, I have encouraged my students to use the Cornell method for note taking. When I arrived here in St Helena in September of last year, four weeks after the start of the academic year, I found my A level students had been studiously poring over the textbook, with the net result that I had an additional half dozen hand-written copies of the first few chapters, yet very little retention of the content. Copying by rote doesn’t work. Hardly a revelation, but true nevertheless. In order to learn effectively we need summaries alongside the “big picture”, and as wide a variety of different methods of presenting information simply as possible & drawing connections between related ideas. Crucial to the long-term learning process is revisiting material regularly, reassessing it in the light of further learning later on and consolidation that transforms it from “stuff we learned earlier” to a firm foundation upon which everything else is built. There are many (many!) ways of achieving this, and all of us will be doing it to some degree, but the reason I like the Cornell method is it very easily provides a structure for students to express their ideas in whatever way they feel most comfortable. Upon seeing the copies of the textbook my VI formers provided in my first weeks here, I placed an embargo on lined paper and made everyone use the Cornell layout. At first the students didn’t get it – “doesn’t it just mean we write less?” – but eventually, over time, it started to stick. This is used for cues – vocabulary, key terms, diagrams, etc. This is often supporting material for the content of the main body. This is used like your standard lined page, though the emphasis is on brevity. Keep it short, use abbreviations if they are helpful and it need not even be in full sentences. My students couldn’t quite handle such a departure from the norm, so the majority of their main bodies are in full sentences, but they do at least . This is the real key – a summary of the topic. The standing homework since the start of the year has been to complete their summaries of the week’s notes by the following week. This establishes a review of material as part of the normal routine, and not done separately, to be lost or filed separately from the lesson it comes from, but right there on the same sheet of paper. I try to keep the amount of note-taking to a minimum, but it’s a necessary evil with such a densely-packed course as the A level. I realised more recently that the retention of understanding about subjects where I gave out handouts wasn’t quite up to the same standard, though, presumably as they hadn’t engaged with the information to quite the same degree. Click to see PDF handout. As a result, I now provide the majority of my handouts in Cornell format, with the content in the main body section, and sections there for cues & summaries just like with their own notes. It’s not revolutionary, and it’s certainly not all we have to do to keep our students engaged & learning for the long-term, but it helps. I agree completely. Note taking in this method really changed the way I was learning all the way back in the silent-movie era of university. Every student that has stuck with this has told me how useful they find it. 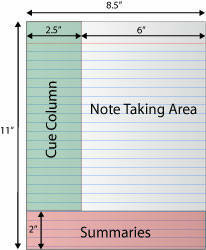 Do you have a really good example of a notes taken using this method? I’m struggling to show how students can use the cues and also write a summary. These two sections tend to just be used sparsely, the cues have been used for titles the majority of the time.